Given a rank-r binary matroid we construct a system of $O(r^3)$ linear equations in $O(r^2)$ variables that has a solution over GF(2) if and only if the matroid is graphic. Geelen, J, & Gerards, A.M.H. (2011). 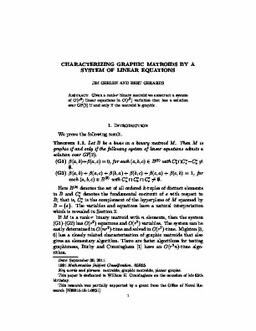 Characterizing graphic matroids by a system of linear equations. preprint (not CWI, to be used with submitted papers).